Nestled on five acres of land on the eastern edge of Portage la Prairie, the lovely Fort la Reine Museum is one of the coolest pioneer villages in all of Canada. 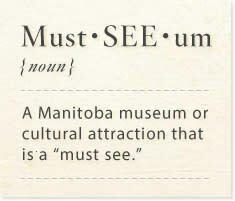 Dedicated to preserving the heritage of the prairies as well as the history of Portage la Prairie, the museum has over 25 historic buildings full of thousands of fascinating, unique and downright weird artifacts (x-ray shoe-fitting, anyone? ).